This free-standing contemporary wine cooler serves up 4 cubic feet of cooling space making it ideal for storing up to 38 bottles of your most beloved wines. The stainless steel-trimmed black wood shelves make it a stunning unit as they match the attractive stainless-steel exterior. This top-of-the-line cooler features two separate storage areas which are independently controlled temperature-wise by a white LED digital thermostat. This enables you to chill white and rose wines in one compartment and red wines in another as the programmable temperature range lies between 4°C and 18°C (39.2°F and 64.4°F). You can quickly program and monitor the temperatures with the push of a button while the thermostat’s display unit can easily be viewed through the tempered-glass door, which also keeps out harmful ultraviolet rays. 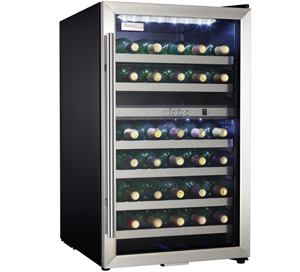 The cooler features an atmospheric white-interior LED track-lighting system which shuns the need of a warm incandescent bulb and unwanted heat and impressively showcases your wine collection. In addition, the stainless-steel towel bar door handle adds an elegant touch and the clever reversible door swing allows you to adjust it for either left or right-hand opening. The 18-month parts and labour warranty with in-home service makes this model even more desirable and economical.